Whether you’re taking your pet on a road trip or on an airplane, finding the right carrier for them can seem impossible. You want to guarantee it’s well secured, but also not so cramped that your pet feels uncomfortable. The Pet Peppy Expandable Pet Carrier may just be exactly what you’re after. Pet owners enjoy that it’s airplane-approved, it’s expandable to provide ample room for your pet, and it’s both lightweight and comfortable. With that said, there are downsides. Some users had the strap break on them, while others didn’t think it was made out of appropriately durable material. Nevertheless, before you make your final decision, let’s take a closer look at the Pet Peppy Expandable Pet Carrier. The Pet Peppy Expandable Pet Carrier is 11 x 11 x 18 inches. When fully expanded, the carrier is 11 x 31 x 18 inches. On Amazon, the carrier comes in three different colors: black, grey, and red. The exterior of the pet carrier is built from waterproof nylon and a mesh lining, so that your pet can see out while still remaining secured within. The interior is lined with a faux fleece bedding. The shoulder strap is padded for your comfort, and the carrier also features metal hooks and self-lock zippers to help safeguard all the features. Travelling with your pet can be difficult at the best of times, so having a carrier that is safe for them and approved by the airline makes the Pet Peppy ideal for your dog or cat. There’s no need for them to go in with the checked luggage and you can keep an eye on them while you head to your destination. Users loved knowing in advance that this carrier was approved for planes, without worry of being stopped from flying because it’s being too large or heavy. As a bonus, your pet will likely remain far calmer and safer with you than when placed with the checked luggage. Additionally, since this is so roomy, your pet won’t feel confined or cramped. Users were happy to report this carrier isn’t made of flimsy material. The outside is a waterproof nylon and mesh with metal hooks and self-locking zippers, along with a padded shoulder strap for your comfort. The inside is lined with a faux fleece so that your pet is comfortable as well. There’s no worry of your dog chewing or breaking through the fabric, although you may need to watch your cat. A few testers did mention their cat being able to claw through the mesh, while others said it was fine. As a final note, don’t be wary of the soft sides; a wire runs through the front and back of the carrier to help keep it stable. A pet carrier isn’t worth much when your furry companion hates it. Luckily, according to many testers, pets love the faux fleece lining. Some owners even reported that, although they expected their pet to resist the carrier or need some time to acclimate, their pet almost immediately laid down inside. Some pets were even far calmer than normal. It’s great to know this product will keep your pet calm and happy, so you can worry less about your furry friend. Some of that calmness may be due to how roomy this carrier is. Some competing brands are nothing more than a plastic box, but the Pet Peppy Expandable Pet Carrier can become over two feet wide! This is by no means a carrier for larger dogs, but anything 14 pounds and under will be just fine. Your pet won’t feel cramped into a small space and you can easily bring them on your journey. If your pet is small enough, you could probably fit a toy or a treat in there to keep them busy. Since the product is expandable, this also means you can customize the amount of free space to suit your pet’s unique size and comfort levels. The carrier also won’t weigh you down. If your pet is already 10 or more pounds, carrying them for a long period of time may strain your shoulder, especially if the carrier adds more weight onto that. However, the Pet Peppy only weighs 10.4 ounces, so you won’t feel extra weight and can truck along effortlessly. It has plenty of storage options too, allowing you to lessen the number of other baggage you need to take along with you. You can easily toss in treats, food, toys, or whatever else you need to make your dog comfortable on your trip. Since the carrier itself is so light, you won’t have to worry about any extras making your bag overweight. Pet Peppy shows they understand what pets and pet owners need by the convenient features included in this expandable pet carrier. 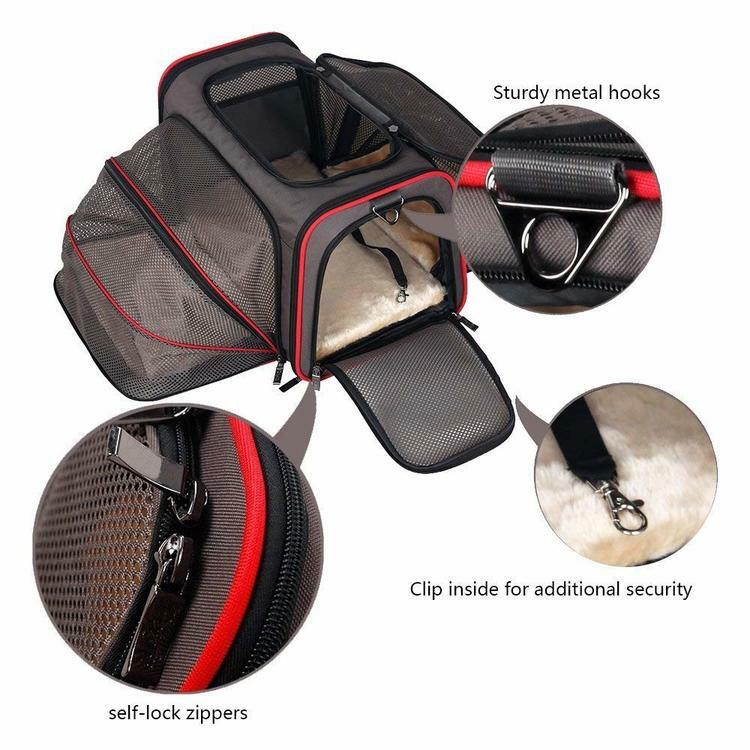 It comes with multiple entries on the top and on its sides, making it easier for your pet to get into the carrier. The padded carrying strap ensures you can distribute the weight of the carrier easily too. And if having this on your shoulders gets too much, Pet Peppy has included a side-strap so you can slip this carrier right onto your rolling luggage. Pet owners were happy to report this carrier isn’t overly expensive. At under $50 on Amazon, it’s far less costly than other, similar ones on the market. With the high-quality materials, the amount of space your pet enjoys, and the fact that you can take it on airplanes, there’s not much more you need. It’s not every day you get such a high-quality product for a price so low. It’s great for those on a budget, and it won’t break the bank should you want to try it for your pet. Pet Peppy has also included a no-risk money back guarantee so their customers can rest assured. Should you not be completely satisfied with Pet Peppy, they’ll issue a return and a full refund. Customers have also praised Pet Peppy for their great customer service. Should you encounter any issues, you’ll be in good hands. You know your pet better than anyone else. If they are too hyper or anxious for something like this (even with its roominess), then it’s not for them. If they tend to break through nearly everything with their claws and teeth, then you can safely assume they’ll escape this as well. If the mesh is something you know your cat may destroy, it’s definitely not the carrier for them. Be sure to take your pet’s personality and behavior into account, so that you aren’t making a needless purchase. A couple of testers did have the strap break on them after only a few uses. This was by no means a common problem, but it did result in a headache for the unlucky few. You may want to check the stitching on the strap once it arrives, so as to guarantee there are no issues. Double checking the strap’s integrity now and then will also save you a surprise break later on. No one wants to be carrying their pet around only to have the bag unexpectedly drop to the ground. A few users were also wary of the material’s quality. As stated before, some cats were able to scratch through the mesh on the bag and escape from the carrier. Other pet owners thought the nylon was flimsy and expected something more robust. At 10.4 ounces, it would be difficult to have a thick material and still remain lightweight. Once again, this was not a common problem but is worth noting before you make your purchase. While the number of zippers on this carrier is a bonus in terms of entries and security, some users have noticed that they do require patience. If you’re in a rush, you may want to get a head start on getting your carrier closed since testers found closing the carrier entirely took some time due to the number of zippers involved. If you’re in a rush, zippers can also get snagged or stuck easier, and you wouldn’t want to ruin your new carrier. While this is more of a note, it’s still best to handle your carrier with care, even though it requires some time. Some busy pet owners found this to be a little annoying, but not annoying enough to write off the bag altogether. After going through all the positives and negatives, we do recommend the Pet Peppy Expandable Carrier. While a few pet owners encountered issues with the carrier, the positives far outweighed the negatives in this case. There are not many products of this nature which can expand to give your pet room, while also being approved to take on airplanes. With the quality materials (especially the soft lining), the ability to expand for your pet’s comfort and unique size, and airplane-approved peace of mind, there’s little this carrier can’t do. If you’ve read the news lately, you’re aware of what happens to pets that are put in the luggage compartment of airplanes. Why not keep them near you, safe and comfortable, and enjoy some peace of mind. Travel is hard enough as it is, and this product makes it easier for both you and your pet. Pet Peppy is committed to making pet owners’ lives more care-free by producing affordable, quality products for your furry ones. Products like their expandable dog carrier have been getting rave reviews across the board. With travel as their main focus, most of their products are designed to be portable and lightweight. This company seems to be new, and we can’t wait to see what other products Pet Peppy has in-store. Because of this though, it will be harder to find the Pet Peppy expandable Dog Carrier both in-store and online. While it’s usually best to check pet supply or home department stores, you can kick-start your search by checking out their website. And of course, you can also find the Pet Peppy Dog Carrier on Amazon. That’s the end of our Pet Peppy Dog Carrier review. Curious to give this to your pup to try?